Healthy chickens need quality feed to keep them in peak condition and that's why we have chosen to feed our flock with Farmgate poultry feeds. 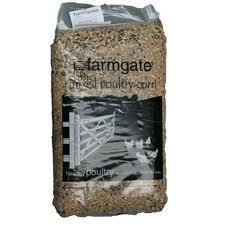 We are stockists of Farmgate poultry feeds and we would be delighted to supply your feed at competitive prices. 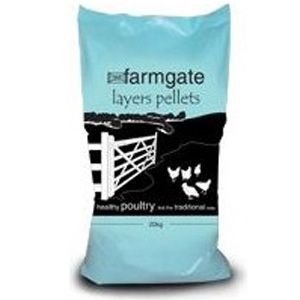 Farmgate Layers Pellets have an excellent pedigree within their range. Layers Pellets contain the optimum levels of calcium, phosphorus and Vitamin D3 for bone strength, good shell quality, rich yellow yolk colour, high egg numbers and excellent egg size. Feed from up to four weeks before onset of lay, throughout the laying period. 16% protein. 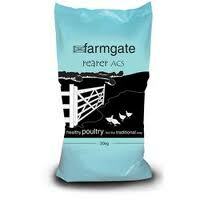 Farmgate Rearers Pellets ACS is a balanced rearing pellet containing essential amino acids and minerals necessary for strong, healthy bones and good feather quality. Suitable to follow chick crumbs through to point of lay for laying birds, or until finisher is introduced for table poultry. 15% protein. 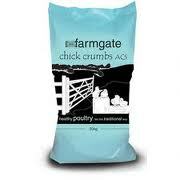 Farmgate Chick Crumbs ACS is a specially formulated starter crumb containing essential vitamins and trace elements. First choice for feeding from day old up to six weeks for laying pullets and up to four weeks for table poultry. 18% protein. Farmgate Classic Mixed Poultry Corn is a complementary feed that may be fed as a supplement to a balanced poultry ration such as Farmgate Layers Pellets. Farmgate classic mixed poultry corn is a blend of Flaked Wheat, French Non GM Cut Maize, UK Biscuit making wheat and EC Black Sunflower. easichick™ is a wood fibre bedding made specifically for poultry. We switched from wood shavings to easichick™ and we have been delighted with the results. We are now authorised stockists of easichick™. Try it yourself, we think you'll be impressed!